Do you want to sing but you don’t — because you were told you don’t have the voice for it? Have no fear, The Fun Bunch is here. 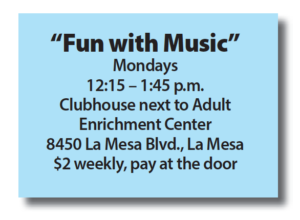 The Fun Bunch is a group of singers ranging in age from 30 to 90 years old, who attend a weekly class called “Fun with Music.” The class meets at the clubhouse next to the Adult Enrichment Center in La Mesa. Everyone’s welcome and no auditions are needed. 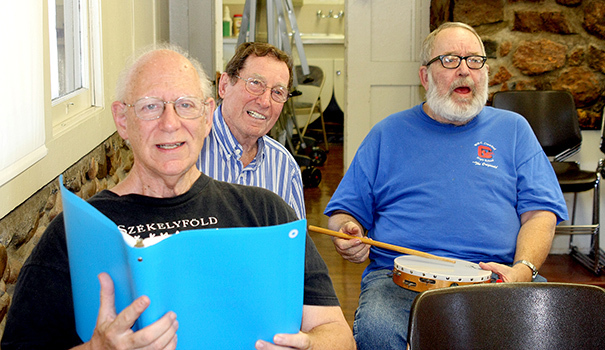 It is a group singalong where lyrics are read from a screen karaoke-style or from a notebook. There’s a signup sheet for anyone who wants to sing a solo or duet, with or without karaoke or accompaniment. The Fun Bunch started as a kitchen kazoo band so kazoos are the instrument of choice, although maracas, drum sticks, and tambourines are also available, and toe-tapping is encouraged. The Fun Bunch was founded by Art Bernard, who recently passed away at age 95. Dorothy said Art started The Fun Bunch 18 years ago after retiring from a sales career. However, his love of music began much earlier in life, playing clarinet in a Chicago high school band. He even received a college scholarship in music, but his mother refused it. “He always played the clarinet, no matter what,” Dorothy said. The Fun Bunch is now organized by James Brown who got involved after meeting Art Bernard two years ago. 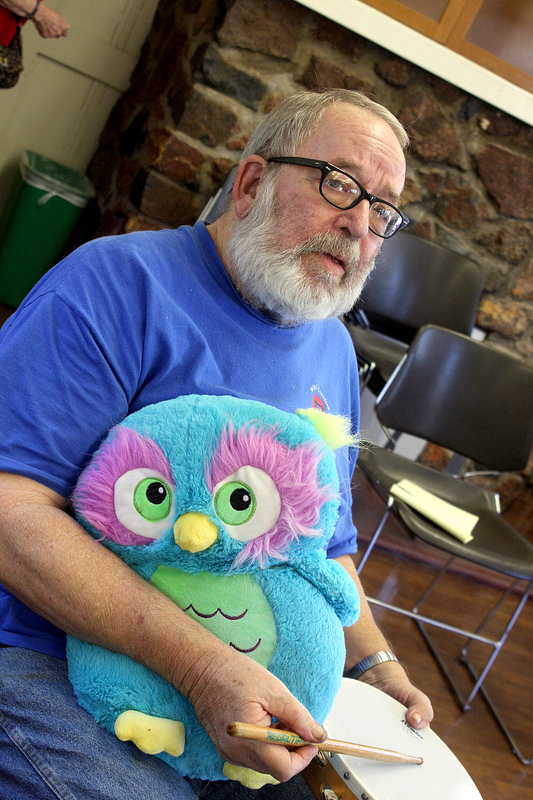 Brown, who calls his volunteer work with the group a “labor of love,” prepares Thursday through Sunday for The Fun Bunch on Monday, creating and refining karaoke tracks for the 14 songs sung by the group and soloists. Everyone is invited to sing a solo regardless of voice quality. Brown’s love of music began at age 6, when he listened to records by Les Paul, Mary Ford, and Rosemarie Clooney. At 17, he bought his first guitar and taught himself to play. He later taught himself to play piano keyboard and bass guitar. He studied Theatre Arts at San Diego State University for three years before enlisting in The National Guard during the Vietnam War. He then took a “temporary” job, lasting 33 years, doing installation and repair work for the Pacific Telephone Company. 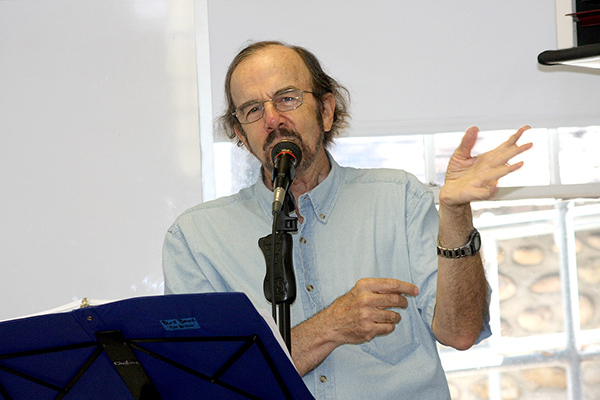 Brown also did some professional music work — including composing and arranging music for the play, “The Tailor of Gloucester” based upon a Beatrix Potter book. He said he has no regrets about not making music his career because he made the best choices he could with the information he had. In addition to amateurs and semi-pros like Brown, The Fun Bunch now draws retired professional musicians as well. John “Hoot” McDonald, a saxophone player, is a weekly instrumental soloist with the group. In the early ’60s, he performed with the likes of Sonny and Cher, Glen Campbell, and the Righteous Brothers. In 1963, he and Carlos Santana played in Tijuana and in 1968 he performed with The Shirelles in downtown San Diego. He still performs with different bands but finds the singing class therapeutic. Robert Cerello is a regular soloist in the group. He began singing when he was a boy. In 1953, at age 12, when his voice was changing, he sang soprano. Even so, his dad and cousin, both wedding singers, encouraged him to practice. Cerello was further inspired to become a singer when he was 14 and watched a TV show where a secretary at the station filled in for a cancelled soloist. She sang a song which sold 1 million records. Cerello thought if she could be a successful singer, then maybe he could, too. The song she sang, “Let Me Go Lover” became his favorite. Cerello was awarded a National Merit scholarship to Pomona College, where he earned a Bachelor of Arts in Theatre Arts and Rhetoric, which led to pursuing a Masters of Theatre and English from University of Virginia where he developed a knack for imitating foreign accents and doing musical theatre, performing in productions of “Brigadoon,” “Camelot,” and “Carousel.” A theater company in Hungary and Romania also hired him to be a soloist in the musical, “Oklahoma.” He also tested his wings in the Big Apple, where he was artistic director of American Art Theatre in New York. But the money ran out before the curtain call. Although Cerello did not land a career as a professional singer, he still has been singing for 60 years. With his many years of experience, Cerello has a lot of advice to impart on new singers. 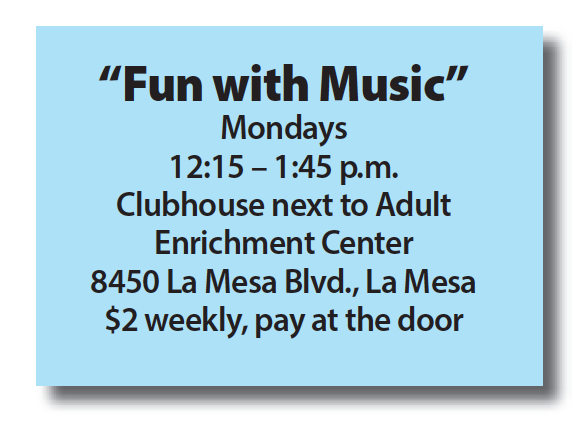 The Fun Bunch gives him a place to practice singing, listen to others sing, and enjoy the camaraderie with those who love music. —Sara Appel-Lennon is a creative writing instructor, children’s author and a former professional clown. Her website is sara-appel-lennon.vpweb.com.